For your convenience, we offer a Glock Sight Installation Service. Simply ship your Glock slide (without barrel or guide rod assembly) and we'll install your sights for $45. In most cases, we install the sights and ship out the next day. There are times when this is not possible obviously, but in 99% of cases, we ship out next day. Ship your slide to CPWSA 84 Ridgeline Road, Talking Rock, GA 30175. Shipping costs for the return of your slide are incorporated into the shipping calculated by the website for the sight set(s) and/or other products purchased. Sights will be installed by a certified Glock armorer. Note: we only do sight installs for sights purchased here. We do not test fire or zero sights. We measure to ensure the new sights are in the middle of the slide. You may drift the rear sight if necessary to make windage adjustments. We only offer the sight installation service for Glock pistols. 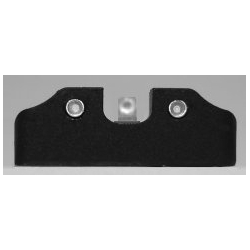 We sell sights for M&Ps, XDs, and 1911s but we do not offer a sight installation service for those pistols.